Cooking with your children during the holiday season offers opportunities to have fun in the kitchen and build lifelong memories. As an alternative to making only sweet, not so healthy holiday treats, consider preparing healthier versions from scratch with your children using simple substitutions or additions. This will significantly improve the nutritional content without compromising flavor or fun! Substitute whole wheat flour for all-purpose white flour--Use ¾ to one cup of whole wheat flour to replace one cup of all-purpose flour. Since whole wheat flour is slightly denser, you may need to add a bit more liquid to the recipe. Nutritional Benefit: Whole wheat flour provides more fiber, vitamin E, B vitamins and trace minerals such as magnesium, iron, zinc and copper than all-purpose, white flour. Substitute flaxseed for butter or oil in baked goods--Flaxseed provides a fat substitute in most recipes. Three tablespoons of ground or milled flaxseed can replace one tablespoon of margarine, butter or cooking oil. Grind flaxseed in a coffee grinder or purchase packaged ground flax seed/flax seed meal. Flax has a slightly nutty flavor. Add to baked goods for a nutritional boost. Nutritional Benefit: Flaxseed contains lignans, a type of fiber and alpha-linolenic acid (ALA), which is an omega-3 fatty acid. Both help prevent inflammation that affects the body’s immune system and may also lower risk for certain types of cancer. Nutritional Benefit: Nuts are rich in healthy, monounsaturated fats. They help stabilize blood-sugar levels and improve cholesterol and triglycerides, which may reduce the risk of diabetes and heart disease. Nuts are high in fiber, magnesium, potassium and vitamin B6, which increase protection against cardiovascular disease. 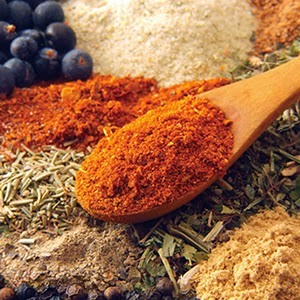 Spices such as cinnamon, cloves and all-spice--For generations, traditional herbs and spices have been used as food, flavor enhancers, as well as to treat ailments. There is scientific evidence supporting how these herbs and spices provide medicinal properties that alleviate symptoms or prevent disease. Nutritional Benefit: Many spices such as cinnamon, cloves and ginger not only add flavor, they are high in antioxidants and other health promoting properties. Enjoy holiday goodies more by modifying recipes just a bit to create healthier alternatives without sacrificing taste!